How To Withdraw Money From Clixsense to Payoneer – A Step By Step Guide. This article was last updated on 07/05/2017. If you are wondering How To Withdraw Money From Clixsense or if you can’t find your cash out link, then you’ve come to the right place. In this post I will show you step by step how to withdraw your hard-earned money from Clixsense. Many users in the Clixsense Forum had this question, that’s why I decided to do this small tutorial. I recommend you create an account with Payoneer to request withdrawals from Clixsense. Payoneer is available to all the countries in the world and you can request withdrawals to them, not only from Clixsense but from any American Company that offers a way to make money. The only draw back is that you need to have at least $20 in your account before you can request your payment, but hey, nothing is perfect in this life. 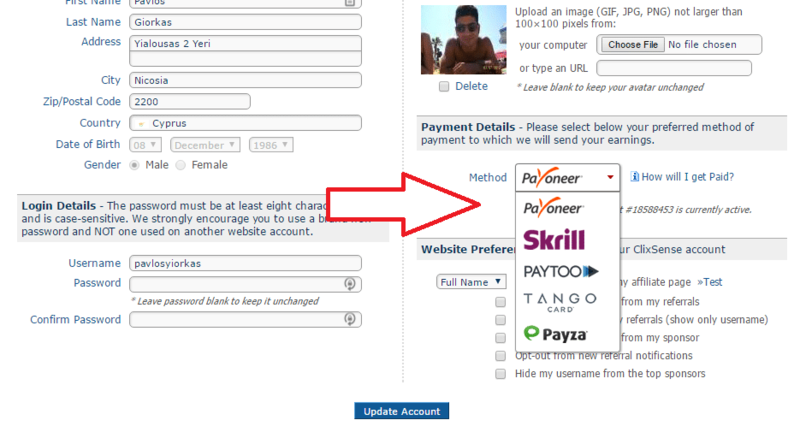 Before you do anything, go to Payoneer.com and create an account. Then you need to come back to Clixsense and connect your account. Got to your account settings to connect your Clixsense account with Payoneer. Click to Connect your account with Payoneer. By the way, you can choose to connect with any other method you like. Now that you’ve connected Clixsense with Payoneer, click again on your Account Tab to proceed with your payment. Click on the Cashout Link (marked in Red). Note that my balance is over the minimum amount needed to cashout. This is why the cashout link is available. 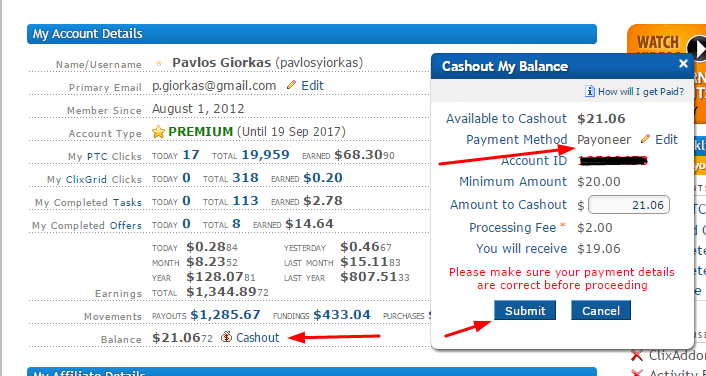 If the money in your account are not enough, then the cashout link will not appear. Note that on the screenshot below, my payment account is Payoneer. It is palced there automatically to remind you where you will withdraw your money. After you click the cashout link, hit the submit button and… that’s it. You’ve just cashed out your money. So it wasn’t so hard after all.. Most people get confused when they cannot find the withdraw button. As I said earlier, the cash out button will not appear until you have reached the minimum payment amount which is $20 – if you are requesting a withdraw to Payoneer. If you have any questions, please submit them through the comments system below and I will answer them right away. Also, if you liked the tutorial, please share it with your friends. ← What is a Gaming Desk and Why you Should Get One? Clixsense makes payments once per week. I don’t know what might happened with your situation. I suggest you visit the forum and post your question there or contact Clixsense directly. I’m getting my payments about one week after I request for a cash-out. Clixscense is an awesome tool to earn easily!!! YOU can AT LEAST earn USD800 per month!!!! Hello…I’m francis pieza from Philippines..I want to earn also in clicksense, but the problem is I haven’t paypal account..it is difficult also in registering method of payment ,there’s no check method. I want check method because it is easy to cashout here in Philippines…pls. Help me.. Here’s my email add. 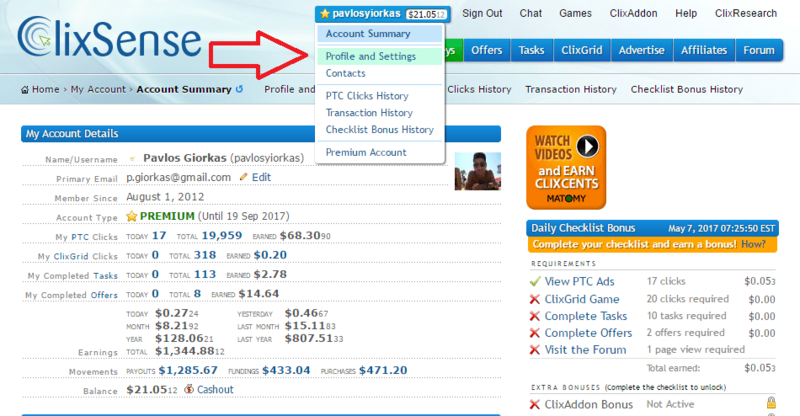 The best and most easiest way to cashout from Clixsense or any other ptc website, is through an online Payment Processor. Clixsense offers four payment processors. PayPal, Payza, Paytoo & Neteller. Why would anyone want to get his money via check instead of a Payment processor? is there any condition during cash out to verify my paypal account with clixsense in order to get paid just like buxp.as a member of buxp you have to verify your paypal account with buxp in order to get paid tats y i asking this. I am from Bangladesh. Can I get my payment by Neteller from clixsense. in search results. You write interesting content but you should rank your website higher in search engines. Getting paid from Clixsense to Payoneer is almost same as to PayPal account . Only the difference is the minimum payment balance. I freaked out when I went to request for cashout to my Payoneer account for the first time and found the minimum cashout balance to be $20. It took me few more days to increase my earning balance and request the cashout. The $20 minimum is very high for the first time user. The $20 has resulted in lost of many of my referrals, as maximum were only ads clicker. First payment by check? I have been trying to cash out at Clixsense as a first time user. The cash out link tells me to verify my details, I do that and then it tells me to enter my name. I do that and then it tells me to verify again. I never get past verify. Its over neighty dollars. Just wondering if they will ever pay? does payoneer support in bangladesh? Hai, can you suggest me what is the best payment method by clix universe . I m from India. The best method is using Payoneer.